Everyone who knew the make and model of this car before reading the copy, raise your hand. Yeah, that’s what I figured. 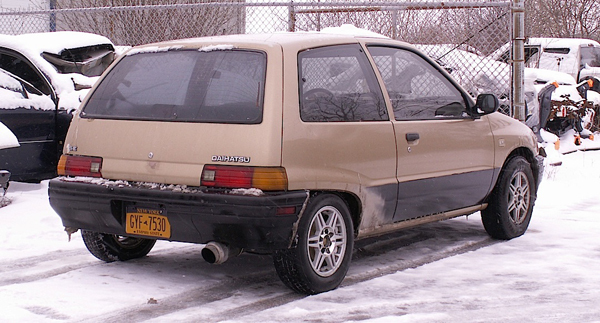 It’s not every day (or every year, even — or maybe, ever) that you come across a 1990 Daihatsu Charade. This is a third generation Charade, and these were sold in the U.S. only from 1988-92. Sales ended here when Toyota bought a controlling interest in the company. Daihatsu is Japan’s oldest automobile manufacturer, and is still in business under the Toyota umbrella. Saw this Charade at the tail end of winter in Wheatfield. Jim Corbran, RRofWNY The post RealRides of WNY appeared first on Buffalo Cars.